Yesterday Google announced that they are now serving Opera Mini visitors to news.google.com a version of the site that’s optimized for their browsers. 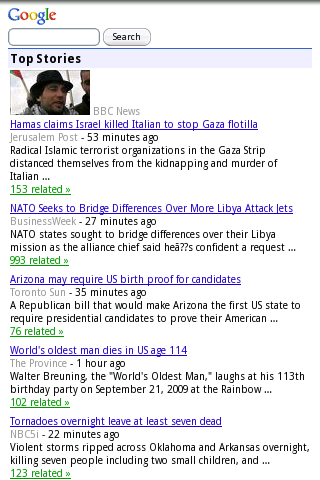 Up to now Opera Mini users had been seeing the bare bones legacy mobile version of News. The legacy view is optimized for embedded feature phone WAP browsers and only displays five headlines from a single section per page with no images. Google News for Opera Mini is very similar to the Touch version that the iPhone, Android, WebOS and bada browsers have been getting for a couple of years. It shows about 30 headlines with thumbnails. The headlines are organized by section. 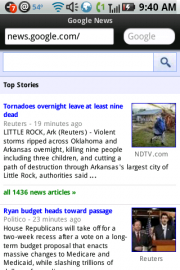 The images above show (from left to right) the Opera Mini, Android and legacy views of Google News. As you can see in the screen shots the main difference is that the Opera Mini variant is missing the “Jump to” section menu and the tabbed navigation bar of the Android one. Opera Mini is the most widely used browser in the world with over 100 million users. It’s especially popular in the developing world thanks to its amazing ability to deliver a rich web experience with basic and older devices and slow networks. I think it makes a lot of sense for Google to go after this market. 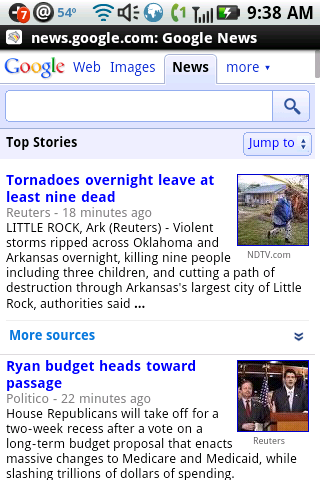 While I was testing Google News in various browsers I noticed that Google is still serving the legacy Google News view to the Opera Mobile 11 and the Symbian^3 browsers on my N8. I was able override that and use the touch version by visiting news.google.com/news/i . 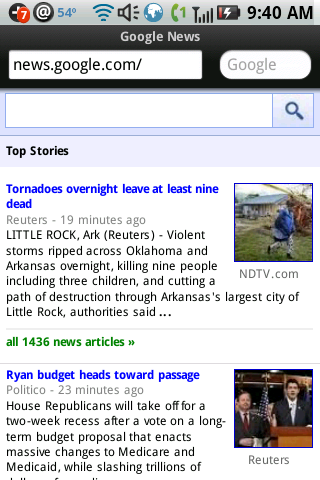 Both Opera Mobile and the Symbian^3 browser seemed to be able to handle the Google News touch view with no problems. 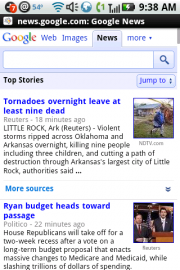 This entry was posted in News Sites and tagged Google News, Opera Mini, Opera Mobile, Symbian by Dennis Bournique. Bookmark the permalink.